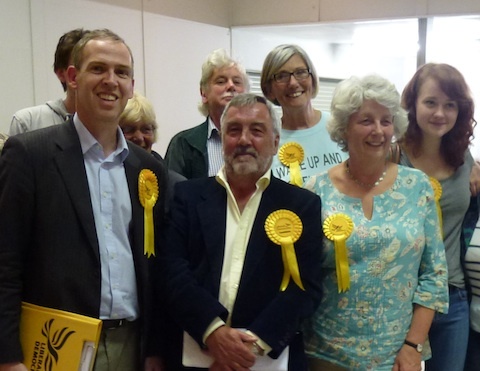 The Liberal Democrats wiped the floor with the Conservatives last night (September 25) to overturn a massive 55 per cent majority and take the Lovelace ward, normally one of the safest Tory seats at Guildford Borough Council, with a 330 vote majority. A total of 879 votes were cast. It is the first time since the re-organisation of Guildford Borough in 1974 that the seat, which covers Ripley, Ockham and Wisley in the north-east corner of the borough, has not been held by the Conservatives. The full by-election result was: Colin Cross, Lib Dem 555; Ben Paton, Conservative 225; David Sheppard UKIP 63; Robin Woof Labour 32. The turnout, whilst not of Scottish referendum proportions was, at 48.7 per cent, higher than usual for a council by-election. Lovelace is one of the smallest wards in Guildford Borough, in terms of population, comprising around 1,800 registered voters. It returns a single councillor. Strong local feelings over the Local Plan did not materialise into votes for the Conservative candidate Ben Paton, despite his vociferous commentary and very strong criticism of the Conservative led council over recent months. Looking glum, apparently aware of the likely outcome even as he entered the count venue,Ripley Village Hall, he cut a rather disconsolate and lonely figure. In his victory speech Colin Cross, addressing an audience who were overwhelmingly Lib Dem Supporters, said: “Team Ripley I cannot thank you enough.